AccurateShooter.com offers a cool page with over 50 FREE downloadable targets. You’ll find all types or FREE targets — sight-in targets, varmint targets, rimfire targets, bullseye targets, tactical targets, load development targets and more. CLICK HERE for all our free targets, including our LOAD DEV target. OK, if all that isn’t enough, we just found four new targets that we really like, plus our fan favorite “bughole” target. This is a nicely-designed six-bull grid target. Use this for load development or accuracy testing. Set your scope so you can aim at the orange diamonds while your shots impact in the box above. This target has a visible background grid so it is easy to estimate your group size. You’ll find other load development targets in this Shooters’ Forum Thread. With this playing card-themed target, each shooter takes five shots and the one with the highest hand wins. You can also shoot for four-of-a-kind, against the clock, fastest four (without a mistake) wins. Fly Shoot Target — Can You “Bug-Hole”? Go for true “bug-holes” with our Fly Shoot Target. You can shoot all the flies first, then go for the smaller black dots. Watch out for the bio-hazard rings! Share the post "Five FREE Printable Precision Shooting Targets"
What’s Up with Those Pesky Flyers? Occasionally someone will ask, “Why did I get a flyer that didn’t go in with the rest of my group?” If I had an answer that would stop flyers from happening, I would be rich. There are many reasons why this can happen. Everything from gripping a forearm differently to variations in the brass casing, the list goes on and on. Most of the time the flyer is usually shooter induced and sometimes what you may think is a flyer, is just part of your group. There are a lot of shooters, that go out and test a load and they may shoot a 3/8” group at 100 yards and think that load is good. But I have seen far too many times that you can shoot another group, same load, same rifle and the next time you may get a 1 ¼” group. The total opposite can also occur. You may shoot a 1 ¼” group and turn around and follow it with a 1/2″ group without changing anything. If you only shot the one group, you might decide that load wasn’t any good and move on to something else without really knowing what that load was capable of. To really determine how a particular load is performing we need to shoot multiple groups and take an average of the group sizes to really see what that rifle/load combination is really capable of. I suggest shooting a minimum of three 5-shot groups and averaging the group sizes before deciding if the load is acceptable or not. Obviously the more rounds you shoot for a group and the more groups that you shoot, you will get a much better representation of what that particular combination can do. Now I’m not saying to go out and shoot 30 groups with 50 rounds in each group to determine how well your load is shooting. That would be a bit pointless, in some cases it would be time to re-barrel your rifle before your load development was finished. In most cases, I feel that three to five, 5-shot groups will give you a pretty good representation of how a load will perform in that specific firearm. Share the post "What’s Up with Those Pesky Flyers?" Here is an article Glen Zediker wrote for the Midsouth Blog. In this article Glen gives important advice on selecting, handling, seating, and testing primers. The right primer choice can and will affect your load’s performance and accuracy. And proper primer handling is essential for safety. Glen is the author of many excellent books on reloading. This article is adapted from Glen’s books, Handloading For Competition and Top-Grade Ammo, available at Midsouth HERE. For more information about other books by Glen, visit ZedikerPublishing.com. The primer is one component in the collection that might not get all the attention it warrants. That’s because it is the one thing, above all other components, that you don’t want to just swap and switch around. We’ve all heard cautions about testing new lots of every component, especially propellant, but primers not only change lot to lot, they vary greatly in their influence on any one load, brand to brand. The difference in one brand to the next can equal a good deal more or less pressure, for instance. While there are “general” tendencies respecting the “power” of various-brand primers, always (always) reduce the load (propellant quantity) when switching primers. When I switch primers, whether as a test or a necessity, I reduce my load ONE FULL GRAIN. There can be that much effect. A primer is made up of a brass cup filled with explosive compound (lead styphate). Lead styphate detonates on impact. Primers don’t burn – they explode! In the manufacturing process, this compound starts as a liquid. After it’s laid into the cup, and while it’s still wet, a triangular piece or metal (the “anvil”) is set in. When the cup surface is struck by the firing pin, the center collapses, squeezing the explosive compound between the interior of the cup and the anvil. That ignites the compound and sends a flame through the case flash hole, which in turn lights up the propellant. Don’t underestimate that. I’ve had one experience that fortunately only created a huge start, but I know others who have had bigger more startling mishaps. These (almost always) come from primer reservoirs, such fill-tubes. Pay close attention when charging up a tube and make sure all the primers are facing the right way, and that you’re not trying to put in “one more” when it’s full! That’s when “it” usually happens. What will happen, by the way, is akin to a small grenade. Static electricity has also been blamed, so keep that in mind. Primers come in two sizes and four types. “Large” and “small”: for example, .223 Rem. takes small, .308 Win. takes large. Then there are pistol and rifle in each size. Rifle primers and pistol primers are not the same, even though they share common diameters! Rifle primers [normally] have a tougher cup, and, usually, a hotter flash. Never swap rifle for pistol. Now, some practical-style competitive pistol shooters using their very high-pressure loads (like .38 Super Comp) sometimes substitute rifle primers because they’ll “handle” more pressure, but they’ve also tricked up striker power. That’s a specialized need. Further, some primer brands are available with a “magnum” option. Some aren’t. My experience has been that depends on the “level” of their standard primer. A magnum primer, as you might guess, has a more intense, stouter flash that travels more “deeply” to ignite the larger and more dense powder column. It reaches further, faster. Flash Consistency is very important, shot to shot. The consistency of every component is important: bullet weights, diameters, case wall thicknesses, and all the way down the list. We’re hoping to get more consistent behavior from a “match” or “benchrest” primer, and we’re paying more for it. I can tell you that some brands that aren’t touted as “match” are already consistent. That all comes from experience: try different primers, just respect the need to initially reduce the load for each test. I can also tell you that my notes tell me that the primer has a whopping lot to do with how high or low my velocity deviations plot out. One last thing — there are small variations in primer dimensions (heights, diameters) among various brands. These variations are not influential to performance. However — small diameter variations can influence feeding through priming tools. This can be a hitch especially in some progressive loading machines. Manufacturers usually offer insight (aka: “warnings”) as to which are or aren’t compatible, so find out. This article is adapted from Glen’s books, Handloading For Competition and Top-Grade Ammo, available at Midsouth HERE. Learn more about Glen’s books at ZedikerPublishing.com. Share the post "Primer TECH: Important Things You Need to Know"
Share the post "Father Develops .223 Rem F-TR Load for His Daughter"
If you have an older version of QuickLOAD, such as V3.1 shown above, then you should definitely upgrade. This will give you more complete and up-to-date cartridge, powder, and bullet data files. Got QuickLOAD software? Then it’s time to upgrade your data files — new data became available in January 2018. 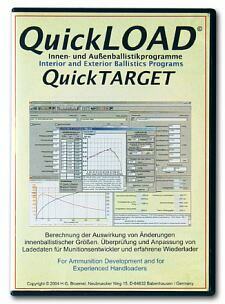 The makers of QuickLOAD offer inexpensive CDs with updated data files (for propellants and projectiles). These data update CDs will add the latest available powder, cartridge, and bullet files to your current version of QuickLOAD/QuickTARGET. There are two update CDs now offered with data current through January 2018. One handles the older installations, QuickLOAD/QuickTARGET 3.0, 3.1, 3.2, 3.3, 3.4, and 3.5. A second update CD works for QuickLOAD/QuickTARGET 3.6, 3.8, and early 3.9. This second disk is primarily a data update. QuickLOAD is a pretty amazing program. Using information for over 1200 cartridges, 250 powders, and 2500 bullet types, QuickLOAD allows you to predict velocities and pressures for your hand-loaded ammo. You can check predicted pressures with different powder choices and seating depths before loading an actual round. If you do not yet own QuickLOAD, you can now order the latest Version 3.9 of this unique software. Priced at $152.95, the latest version 3.9 contains all the updates through January, 2018 and is compatible with WINDOWS 2000, XP, VISTA, Windows 7, Winows 8 and Windows 10. QuickLOAD/QuickTARGET 3.9 can be purchased for $152.95 from Neconos.com. For a full explanation of the features and benefits of QuickLOAD software, click the link below. EDITOR’S Comment: We believe every serious rifle hand-loader should own and use QuickLOAD. We have used this program for over a decade. It is invaluable in load development, particularly when testing a variety of bullets and when changing seating depths. This software is NOT a substitute for standard, conservative reloading practices. However QuickLOAD can very surprisingly effective in comparing cartridge performance and predicting the effects of changes in charge weight. Share the post "QuickLOAD Software — Get the Latest Update NOW"
Quarter-MOA, Half-MOA? How Much Precision Is Really Enough? This impressive 15-round group was shot by Jim See of Elite Accuracy. Different shooting disciplines demand different levels of precision/accuracy. In the rapid-fire 3-Gun game, you could probably “clean” most stages with a 2-MOA rifle. By contrast, in the short-range group benchrest game, to compete with the best, you’ll need a rifle that shoots in the “ones” (i.e. 0.1-0.19 MOA) in perfect conditions. In 1000-yard F-Class competition, the top shooters want a rifle that will hold one-third-MOA of vertical at that distance. What is your standard of accuracy? How good is “good enough”. Jim See, a skilled gunsmith and successful PRS competitor, has answered that question for his tactical discipline. For the kind of matches Jim shoots, he likes to have a rifle that will hold half-MOA for five (5) shots, 3/4-MOA for 15 shots, and 1 MOA for twenty shots. Remarkably, Jim’s rifle can do that with factory ammo. Above is an impressive 15-shot group shot with .260 Remington Federal Premium Ammo. It’s said that you “can never have too much accuracy”, but there are acceptable standards for each discipline, and they’re not the same. A 100/200 yard Benchrest shooter will be sorely disappointed with a rifle/ammo set-up that can only deliver half-MOA. On the other hand, a PRS competitor like Jim See can achieve great success with a lesser degree of precision. This means you can save time and money. You can run your barrels longer between cleanings, and you don’t have to go “full OCD” when loading your ammo. The PRS shooter does not need to weigh-sort primers, or load powder to single-kernel standards. Proof is the performance. Jim See recently took third place at the Spearpoint Shootout, and he has been a podium finisher at other events. Learn more about Jim’s gunsmithing and training operations at EliteAccuracy.com. Jim’s target seemed a bit familiar. AccurateShooter.com created this Diamond and Dot Target a few years back. On each aiming point, there are high-contrast black horizontal and vertical lines for aligning your cross-hairs. The gray circle lets you see the bullet impacts above, without obliterating the red diamond, which is quite useful for precise aiming (we put fine cross-hairs on the points of the diamond). This target sheet includes data entry tables below each of the three aim points. There are many other free targets out there, but this format is very popular. We’re pleased to see Jim using it. You can download this and dozens of other FREE Targets from the AccurateShooter.com Target Page. Share the post "Quarter-MOA, Half-MOA? How Much Precision Is Really Enough?" When developing a load for a new rifle, one can easily get consumed by all the potential variables — charge weight, seating depth, neck tension, primer options, neck lube, and so on. When you’re fully focused on loading variables, and the results on the target are disappointing, you may quickly assume you need to change your load. But we learned that sometimes the load is just fine — the problem is the trigger puller, or the set-up on the bench. Here’s an example. A while back we tested two new Savage F-Class rifles, both chambered in 6mmBR. Initial results were promising, but not great — one gun’s owner was getting round groups with shots distributed at 10 o’clock, 2 o’clock, 5 o’clock, 8 o’clock, and none were touching. We could have concluded that the load was no good. But then another shooter sat down behind the rifle and put the next two shots, identical load, through the same hole. Shooter #2 eventually produced a 6-shot group that was a vertical line, with 2 shots in each hole but at three different points of impact. OK, now we can conclude the load needs to be tuned to get rid of the vertical. Right? Wrong. Shooter #3 sat down behind the gun and produced a group that strung horizontally but had almost no vertical. What was the problem? Well, each of the three shooters had a different way of holding the gun and adjusting the rear bag. Shooter #1, the gun’s owner, used a wrap-around hold with hand and cheek pressure, and he was squeezing the bag. All that contact was moving the shot up, down, left and right. The wrap-around hold produced erratic results. Shooter #2 was using no cheek pressure, and very slight thumb pressure behind the tang, but he was experimenting with different amounts of bag “squeeze”. His hold eliminated the side push, but variances in squeeze technique and down pressure caused the vertical string. When he kept things constant, the gun put successive shots through the same hole. Shooter #3 was using heavy cheek pressure. This settled the gun down vertically, but it also side-loaded the rifle. The result was almost no vertical, but this shooting style produced too much horizontal. Conclusion? Before you spend all day fiddling with a load, you might want to adjust your shooting style and see if that affects the group size and shape on the target. Additionally, it is nearly always useful to have another experienced shooter try your rifle. In our test session, each time we changed “drivers”, the way the shots grouped on the target changed significantly. We went from a big round group, to vertical string, to horizontal string. Interestingly, all three shooters were able to diagnose problems in their shooting styles, and then refine their gun-handling. As a result, in a second session, we all shot that gun better, and the average group size dropped from 0.5-0.6 inches into the threes — with NO changes to the load. That’s right, we cut group size in half, and we didn’t alter the load one bit. Switching shooters demonstrated that the load was good and the gun was good. The skill of the trigger-puller(s) proved to be the limiting factor in terms of group size. Share the post "Rule Out “Driver Error” — Test Accuracy with Multiple Shooters"
Here’s a smart new product from Midsouth Shooters Supply: 250 self-adhesive Benchrest Targets on a convenient roll. Not just for benchrest competitors, these stick-on targets work great for anyone doing load development. Each target offers a precision 1/4″ grid at the top with diamond aiming box below. This is similar to official targets used in Benechrest matches, with the addition of the upper grid lines which allow you to instantly estimate group size. These targets also include an area to list your load components. Midsouth sells the 250-target roll for $14.98. This target was designed for benchrest shooting, developing new loads or cataloging existing ones. This easy-to-use target has a 1/4″ grid pattern at the top which helps measure groups. The vertical aiming square at the bottom helps align the cross hairs of your scope for consistent shot placement. At the very bottom of the target there is room to record your reloading information. Each Target sticker measures 6″ x 4″ with a 4.5″ x 2.5″ printed area. Share the post "Precision Targets By the Roll from Midsouth"
This article was written in 2014 for the Sierra Bullets Blog. It describes one method of load development that is commonly used. There are other methods that can work also. Some guys first isolate seating depth and then fine-tune velocity with charge weights. Other guys may aim for a known velocity node (speed range) and then optimize accuracy by adjusting seating depth. Still others look for smallest ES and tightest vertical to minimize 1000-yard vertical dispersion. There are many ways to skin a cat. Different rifles (and even different barrels) can demand different styles of load development. In this instance the writer achieved desired results seating his bullets .007″ back from max “jam” length. For other applications (and other barrels) you may get the best, most consistent results seating off the rifling by .020″ or more. In disciplines with quick-fire such as PRS, it may be wise to develop loads that “jump” the bullet. Since I just put a new barrel on my F-class rifle… I figured it might be a good time to discuss load tuning for long range shooting. Getting the most accuracy out of your rifle is one of the most important aspects of load tuning. For long range shooting in particular, using a load that produces the least amount of vertical variation is vital. There are several steps to the process that I use, so I will go through the basics of each. Next, I will fire-form some brass using a starting load of powder and bullets seated to “jam” while breaking in the barrel. My barrel break in process is not very technical; it’s mostly just to get the brass formed and the rifle sighted in. I do clean every 5 rounds or so just because I feel like I have to. Once I have the brass formed, I use them to load for a “ladder test” to see what powder charge the rifle likes. With a ladder test, you take your starting load and load one round each with a slightly increasing amount of powder until you reach your max load for that cartridge. You then fire each round using the same aiming point to see where the bullets start to form a group. For this barrel and cartridge, I started at 53.3 grains of H4831SC powder and increased the load by 0.3 grains until I reached 55.7 grains. I always seat my bullets to “jam” when doing a ladder test. We will determine the final seating depth in another test later. It’s usually best to shoot this test at a minimum of 200 yards because at closer ranges the bullets will impact too close together making it hard to determine which load works best. I shot this test at 300 yards. As you can see from the target, the lightest load #1 had the lowest velocity and impacted lowest on the target. Shots #2 and #3 were a little higher and in the same hole. Shots #4 thru #6 were slightly higher yet and all had the same elevation. Shots #7 and #8 were the highest on the target however pressure signs were starting to show. For some reason shot #9 went back into the group and the chronograph didn’t get a reading so I ignored that shot. When picking a load, I am looking for the most shots at the same vertical location on the target. As you can see that would be shots #4 through #6 so I would pick a powder charge from those shots which would be 54.2 grains to 54.8 grains. As a side note, shots #2 and #3 are only 0.851 lower so I wouldn’t be afraid of using one of those loads either. I settled on 54.5 grains as the load I wanted to use. It’s right in the middle of the group so if the velocity goes up or down slightly, the bullet should still hit in the same place on the target. I load 3 rounds at each depth using the 54.5 grain powder charge and shoot a group with each depth at 150 yards. As you can see from the target, the first two groups are not good at all. Next one looks good and is the smallest group on the target. The next three are not quite as small but the vertical location on the target is almost the same which indicates a sweet spot which will help keep the vertical stringing to a minimum on target. I went with 3.470″ which is right in the middle once again and should give some flexibility with the seating depth. So after all of that, my load is 54.5 grains of H4831SC and a cartridge length of 3.470. I plan on loading up enough ammo to shoot five groups of five shots and see exactly how this load works on target as well as what the extreme velocity spreads are over several groups. I sincerely hope some of this information helps you to get the best accuracy out of your rifle. I do not take credit for coming up with any of this, a whole lot of good shooters use this same method or a variant of it when working up their loads. For more information about load development, please contact the Sierra Bullets technical support team at 1-800-223-8799 or by email at sierra [at] sierrabullets.com. Disclaimer: Load data represented here may not be safe in your rifle. Always start low and work up, watching for pressure signs. Share the post "Long Range Load Development for F-Class"
An outfit in Washigton State, Box to Bench Precision, has developed an oversize (23.5″ x 30″) precisely-scaled target designed for load development and scope testing. This target is very innovative. On the target you’ll find various clusters of aim points for various tasks. Upper left are orange aiming spots for testing various powder charges. In the upper right quadrant are more red aim points to be used when testing bullet seating depth. Running down the center of the target is a vertical line with horizontal marks showing precise MOA and Mil heights at 100 yards — use this feature to verify your click values. And there’s more. In the lower right quadrant (far right) are three black targets to be used for chrono work. With these you can record cold velocity, hot barrel velocity and a “Final Velocity”. Over in the lower left quadrant, in the left-most column, are three dot targets for zeroing and recording group size with load data. Finally, four more black/white targets can be used for a scope box test (aka “shooting the square”). With a box test, you move from target to target, clicking in sequence to each corner of the square in sequence, evenutally returning to your original aim point. If your scope tracks correctly, the last box test shot should end up right on top of the first shot. For those used to shooting at conventional bulleyes or benchrest targets, this target may seem confusing, but it can really help organize and simplify the process of load development. We like the idea of having a single, durable target that performs double-duty — serving for load development as well as scope checking. And we like the fact that the target is pretty strong — the maker says: “The target is Tear-Resistant and Water-Proof”. We’d expect a maker based in the Pacific NW to design a target that can handle wet weather. So how much does all this target technology cost? A single, 23.5″ x 30″ target costs $6.99. A pack of three targets costs $19.47, while a five-target pack runs $29.95 (which works out to $5.99 per target). Targets ship in a durable cardboard tube. If you like what you see and want to order these targets, visit the Box To Box Precision Online Store. Share the post "NEW Rifle Load Development and Scope Testing Target"
In this video, Bryan Litz of Applied Ballistics explains how to choose a bullet for long-range shooting and explains what you should be looking for when developing a long-range load. Bryan notes that, with a new rifle build, the bullet you select may actually dictate your gun components. When starting from a “clean slate”, once you select a bullet, you will then pick a barrel, twist rate, and cartridge that are appropriate for that bullet. In choosing a long-range projectile, Bryan recommends you choose a high-BC bullet “that is known for precision”. Then you need to find an ultra-consistent, reliable load. This video is worth watching. Bryan Litz makes some very good points. Bryan says that if you develop a load that can shoot consistent, half-minute groups in all conditions, you should be satisfied. Bryan says that many long-range shooters “spin their wheels” trying to achieve a quarter-MOA load. Often they give up and start all over with a new bullet, new powder, and even a new cartridge type. That wastes time, money, and energy. Editor’s Note: We agree 100% with the points Bryan makes in this video. However, for certain disciplines, such as 600-yard benchrest, you WILL need a sub-half-MOA rifle to be competitive at major matches. 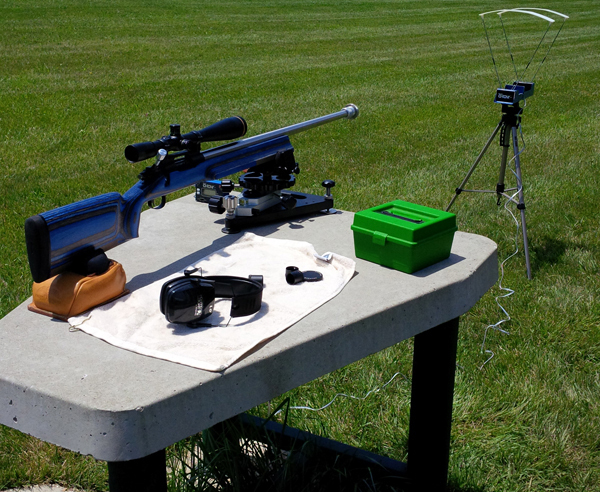 Well-tuned, modern 600-yard benchrest rigs can shoot 1/4-MOA or better at 100 yards. Thankfully, with the powder, bullets, and barrels available now, 1/4-MOA precision (in good, stable conditions) is achievable with a 17-lb benchgun built by a good smith with premium components. Share the post "Loading for Long Range Shooting — Why Consistency Is Key"
Share the post "Accuracy Woes? Multiple Shooters Can Rule Out ‘Driver Error’"
Well each of the three shooters had a different way of holding the gun and adjusting the rear bag. Shooter #1, the gun’s owner, used a wrap-around hold with hand and cheek pressure, and he was squeezing the bag. All that contact was moving the shot up, down, left and right. Shooter #2 was using no cheek pressure, and very slight thumb pressure behind the tang, but he was experimenting with different amounts of bag “squeeze”. His hold eliminated the side push, but variances in squeeze technique and down pressure caused the vertical string. When he kept things constant, the gun put successive shots through the same hole. Shooter #3 was using heavy cheek pressure. This settled the gun down vertically, but it also side-loaded the rifle. The result was almost no vertical, but this shooting style produced too much horizontal. Share the post "Accuracy Problems? Put Another Shooter Behind the Trigger to Rule Out ‘Driver Error’ Issues"